This is the seventh article in a ten-part retrospective of the Harry Potter soundtracks. You may wish to refer to the previous entries in the series for more information. After the — in my opinion — lackluster step backward that was the soundtrack for Order of the Phoenix, I was greatly disappointed to learn that Nicholas Hooper would be scoring Harry Potter and the Half-Blood Prince. The book remains my least-favorite in the series (only narrowly edged-out by Deathly Hallows), and the fact that a composer I didn’t really like the last time he got a shot at the series was doing it again only added to my personal conviction that I wouldn’t like the film. Fortunately, Hooper redeemed himself with the soundtrack for Prince, and I think it’s much better than his last outing. Prince begins immediately with “Opening”, a track that gives us themes we hear several times through the film. I’ll call them “pensive”, “reverse Hedwig”, and “quick”, and I’ll be referring to them as I discuss this soundtrack. In this case, Hooper immediately rectifies, at least in my mind, the major issue I had with his previous soundtrack: that there was no really clear theme tying everything together. So that’s a plus. I mean, in this one, even Slughorn gets his own theme, and you actually hear it in all the scenes he’s the major player in. “The Story Begins” — Right away we get the “quick” theme woven through this track, which deals with the introduction of Slughorn. See, Mr. Hooper? You can tie everything together! “Ginny” — “Pensive” theme, “Hedwig’s Theme”, and even a riff on “Hedwig’s Theme” that manages to keep us in the mood despite the “quick” theme running in the background. “Ron’s Victory” — The “quick” theme again, but riffed a bit so that we get the urgency of Ron playing Keeper and actually being, you know, victorious. There’s also a slight touch of “pensive”. “Into the Rushes” — I actually really liked this scene in the film — it wasn’t in the book, but the screenwriter made a good choice in adding it to give a little more action during a slow part of the story. Hooper chose to reuse his “Death of Sirius” theme over the “quick” theme of this film. Plus we get another listen to “reverse Hedwig”, which hits in a big way later on. “Dumbledore’s Farewell” — An excellent use of “reverse Hedwig” mixed with “pensive” (though mostly “pensive”). Hooper didn’t have to do much with this part, as the director handled it well with the wands-up-and-blow-away-the-Dark-Mark sequence. “The Friends” — By this point in the film, we know that nothing will ever be the same and that Harry is going to go off by himself to find the horcruxes and kill Voldemort. In the books, it works very well as an Empire Strikes Back ending, but unfortunately someone made the decision that we had to have, if not a happy ending to Prince, at least one that wasn’t either totally depressing or directly leading into a sequel (think Back to the Future II). Hooper handles this well, although he doesn’t hit any of the main themes other than a heavily-disguised rework of “pensive” (well, three notes of it, anyway). The sequence of Harry and Dumbledore going to the cave and finding the horcrux is also tied together by all three themes as well as by mood, and there are callbacks to other tracks like “Into the Rushes” and even “Dumbledore’s Foreboding”. After re-listening, I thought of it as more of a single piece of music with three movements — arrival (“Journey to the Cave”), Harry’s part, and Dumbledore’s part. The digitized, strobed voices in “The Drink of Despair” weren’t, to my mind, the best choice, but the “pensive” theme is used to great effect as Harry forces Dumbledore to drink the drink. Then, with “Inferi in the Firestorm”, other than the (to my mind) rather unnecessary use of a chorus and Khan-putting-Ceti-eels-in-Chekov’s-ear violin stylings, we get the “pensive” theme in full force, similar to “Finale” in Azkaban as Dumbledore destroys the inferi. The Biography special about the music of Harry Potter took a few minutes to talk about Nicholas Hooper’s musical decisions in “Harry and Hermione” and “When Ginny Kissed Harry” — played mostly on classical guitar, which Hooper seems to be pretty adept at, I found them to be much more subdued than Patrick Doyle’s “Harry Potter’s Love”, although somewhat out-of-character with the rest of the film despite their use of all three themes. “When Ginny Kissed Harry” has a particularly touching musical phrase that’s repeated several times, and it does stick with you. Throughout the film, Hooper makes interesting instrumentation choices such as the classical guitar — we hear fiddles, jazz beats, pianos, and other instruments, all in the forefront in unexpected ways. It doesn’t always work for the mood of the film (see “Farewell Aragog”), but there’s 28 tracks. Dude’s got to stretch his wings somehow, right? Despite a relatively good soundtrack, we did unfortunately have to deal with such… um… gems… as “In Noctem” — I’ve never, ever been a fan of soundtrack cuts that were just choruses singing with music behind them. “Living Death” was another lead-you-by-the-nose track, but given what was happening on screen at that time, I can forgive it. I can’t forgive it for reusing several themes from Order of the Phoenix in a way that really would’ve worked better in… well… that film instead of this one. But other than that, I didn’t really have a lot of bad things to say about specific tracks, although I will say that Hooper seems to have decided we needed a lot of counterpoint-style high notes (see “Snape and the Unbreakable Vow”) to offset the heavy, moody nature that many of the tracks required. And, speaking of heavy and moody, I was pretty disappointed by “The Killing of Dumbledore”* — it was mostly just “build, build build build build BUILD faaaaaaaaaaaaaaade”. Of course, it wasn’t a really great interpretation of the pitched battle in the novel, but when the director and screenwriter don’t give you much to work with, you do the best you can. I also want to mention that there was only one use of “Hedwig’s Theme”, although the rest of the soundtrack, as with Doyle’s Goblet, made up for it in such a way that I really didn’t notice. Oh, and I would be remiss if I didn’t mention “Wizard Wheezes” and “The Weasley Stomp”, which were pretty cool, but… well, they sounded more like what Michael Giacchino did in The Incredibles and really didn’t fit the mood of the film or its soundtrack**. Think “The Knight Bus” in Prisoner of Azkaban. “The Slug Party” was a more subtle version of the same musical style (though much more jazzy), so I have less of an issue with it than with the other two. 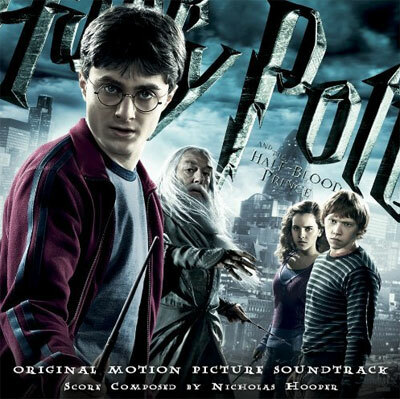 Overall, I think the Half-Blood Prince soundtrack was by far the better of Hooper’s two outings into the Potterverse. While I didn’t like the film almost at all — I’d put Deathly Hallows 1 at the bottom of the list, and this film just above it — I definitely got some enjoyment out of the soundtrack. It’s a solid piece of art, despite its overuse of bells and choruses, and it provides what I felt to be an excellent companion character to the film. * And what is it with this guy naming tracks after the deaths of major characters during climactic moments? ** I also didn’t like the choice to put “The Weasley Stomp” at the end of the soundtrack. It really detracts from the feeling Hooper engenders with “The Friends”.